I can’t resist pork ribs. Especially the BBQ sauce kind. With meat that is falling-off-the-bone tender, even with the sweet and savory BBQ glaze sticking onto every finger, I can chow them down without thinking twice. I made BBQ pork ribs the other day. It was delicious so I thought I might share the sticky divine goodness with you. The recipe has two parts for prep. First, rub to season the ribs and cook at a low temperature in the oven. Then, you make the BBQ sauce from scratch, which is actually not that much work at all, and slather onto the ribs as you finish cooking them in a BBQ grill. It might sound complicated but it is not, and you will soon get the tender juicy succulent pork ribs ready for your hands to lay down on. 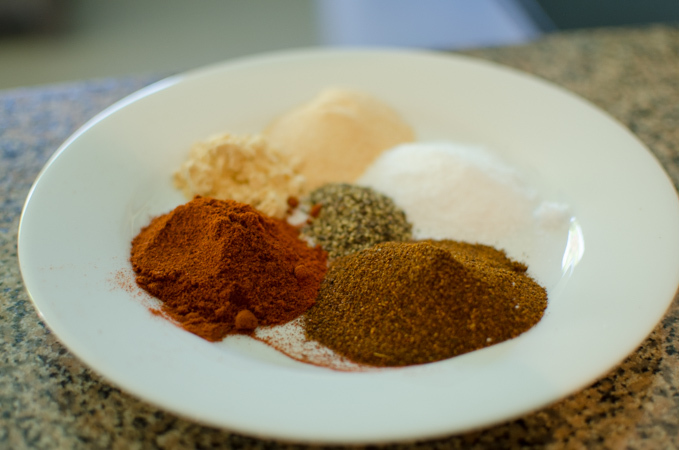 For the rub, you will need salt, chili powder, paprika (smoked), garlic powder, mustard powder, and black pepper. 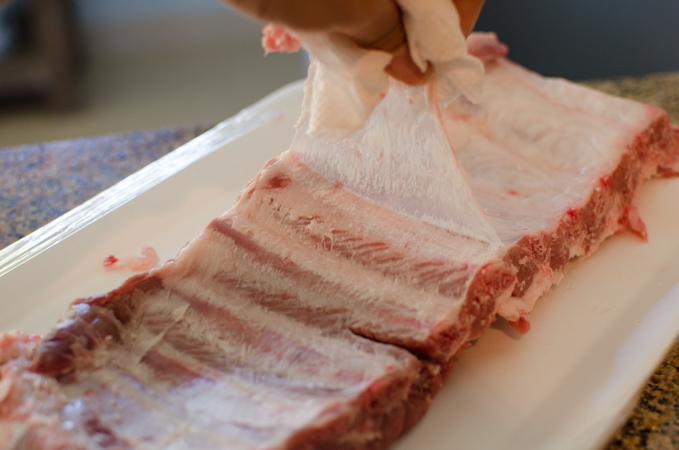 You will want to remove the membrane on the underside of the ribs. Just pull it off from one corner of the meat using the paper towel. Sprinkle with the rub all over, both front and back. 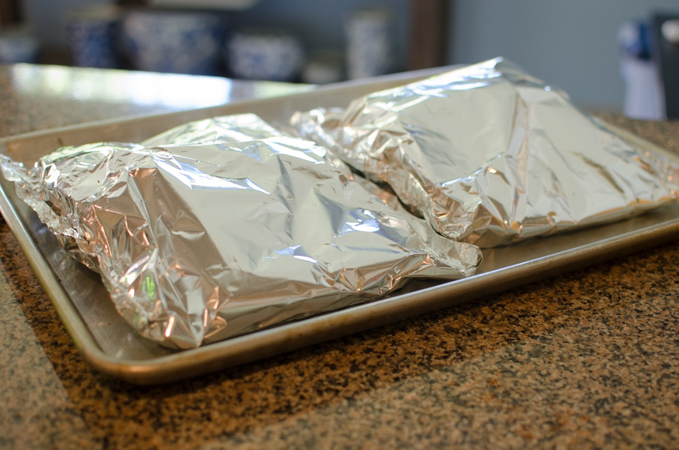 Loosely wrap with the foil and place on the baking sheet. If you have the time, let them chill in the refrigerator for up to 24 hours. It will intensify the flavor. When ready, bake them in a 325˚F oven for 2 hours. Now, for the BBQ sauce. 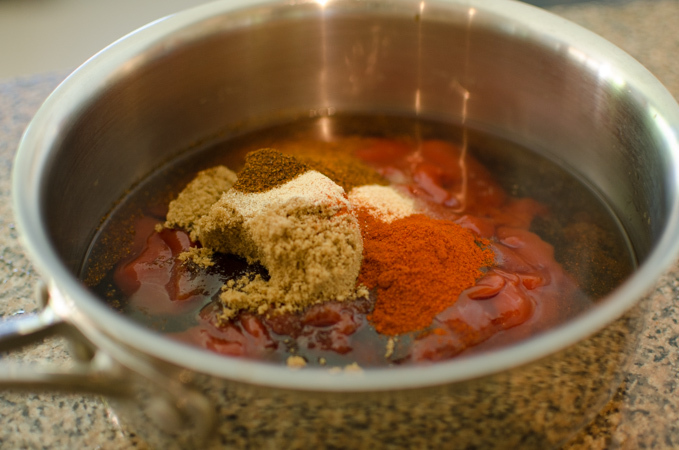 Mix ketchup, water, cider vinegar, brown sugar, molasses, Worcestershire sauce, chili powder, garlic powder, and paprika. Simmer over low heat until it is reduced to about 2 cups. 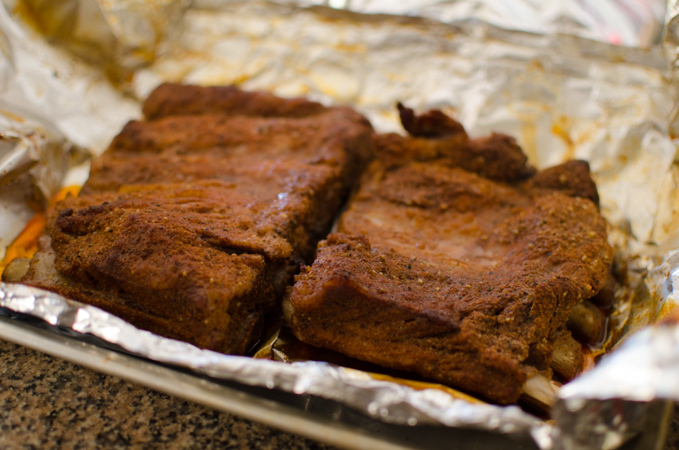 Here are the oven baked pork ribs. You will want to handle these ribs very carefully since they are fall-off-the-bone tender at this stage. 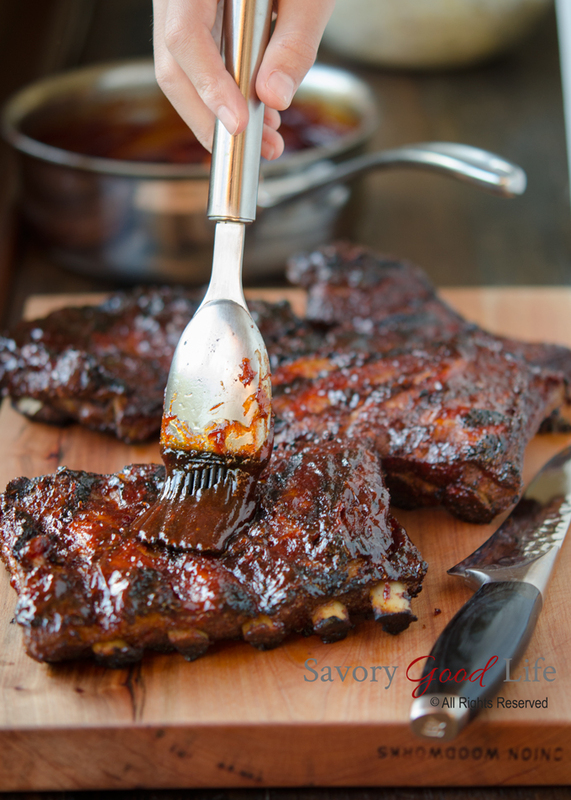 Place the ribs on the hot grill and brush with the BBQ sauce, then close the lid and cook for 5 minutes. Turn over and apply more glaze on the other side. You need to repeat this step again until you get the grill marks and the sauce gets thickened. Make sure to control the heat so you don’t burn them too much. Now, if you don’t have a BBQ grill, you can complete this step in your oven using the broil setting. Baste with BBQ sauce on the ribs every few minutes until you get the desired finish. Here is the finished pork. Oh, my goodness! I am dying again. I can still smell it. I served these ribs to my family with classic potato salad and they were quiet. They were quiet because they were sincerely focused on eating. We had a cheerful dinnertime. 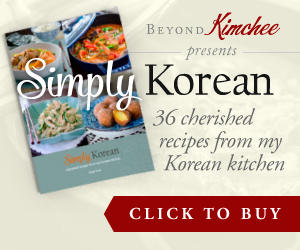 As the cook of the household, I can tell you how proud I was to see my loved ones enjoying the food I made. I am sure you will be, too. 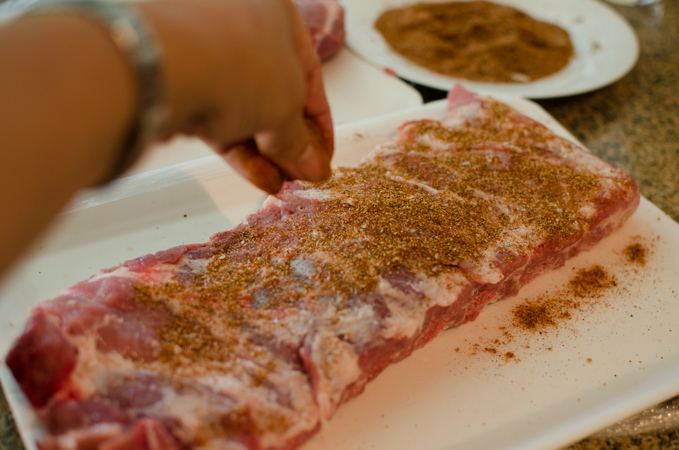 To Make the seasoning rub, place all of the ingredients except the ribs in a medium bowl and stir to combine; set aside. Remove excess fat from the ribs. Peel off the thin membrane attached to the underside of the ribs. Flip the ribs over so they’re bone-side up. Preheat the oven to 325˚F. If you chilled the ribs, you need to let them rest on the room temperature while oven is preheating. Bake them for 2 hours. 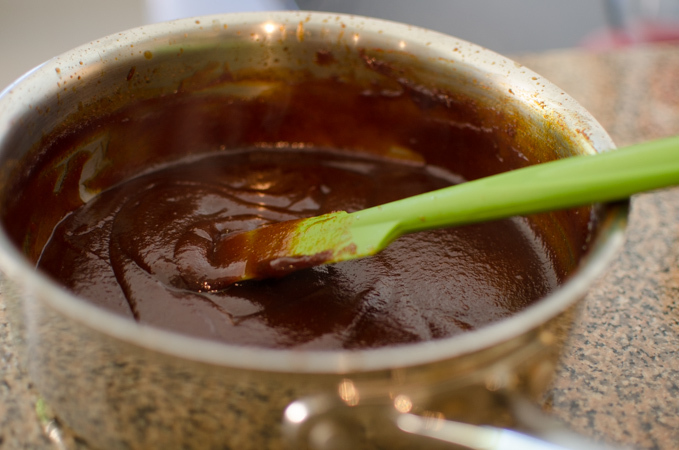 To make the BBQ sauce, mix all of the ingredients in a medium saucepan and bring to a simmer over medium heat, whisking occasionally. Reduce the heat to low and continue to simmer for 30 minutes, whisking occasionally, until the flavors have melded and the sauce has reduced to about 2 cups. Remove from the heat and set aside until ready to grill. Heat a gas or charcoal grill to medium (350°F to 450°F). 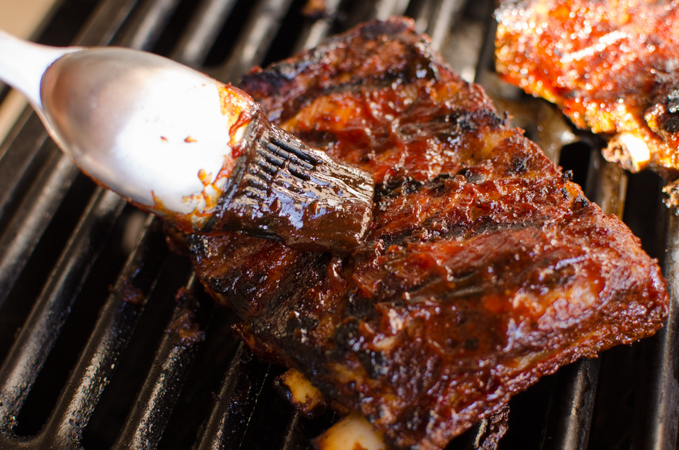 Remove the ribs from the foil, place them meaty-side up on the grill, and brush them with some of the sauce. Cover the grill and cook for 5 minutes. Flip and brush the ribs and cook another 5 minutes. Repeat this step a couple more times brushing every 5 minutes, until the sauce has thickened and the ribs are heated through and have grill marks. I love BBQ ribs! And make them in the oven often. Good stuff -- thanks so much. 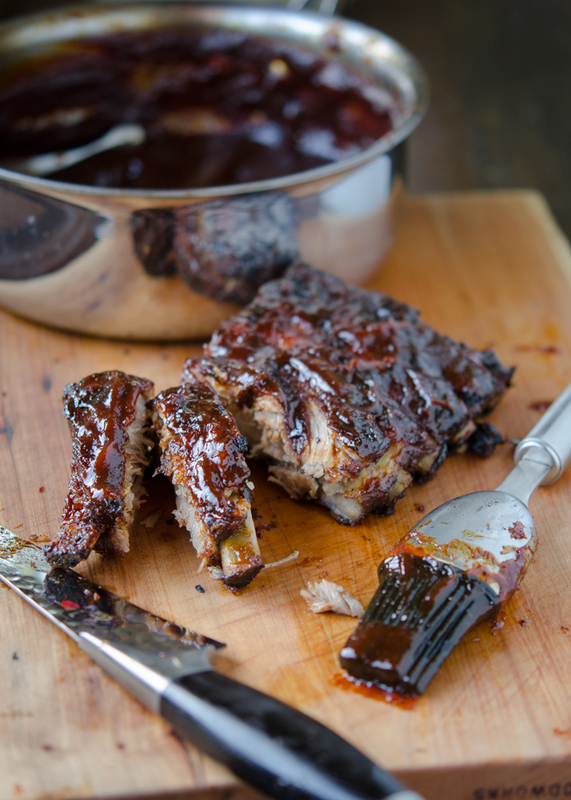 Nothing beats ribs with a sticky sauce! These look delicious. super recipe, and very well explained in pictures, I think anyone could prepare it. I definitely prepared myself this recipe. 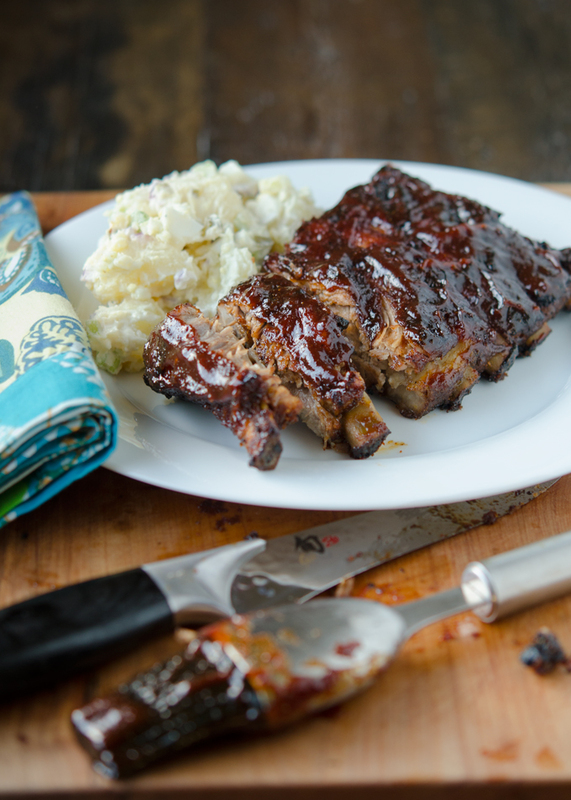 "I served these ribs to my family with classic potato salad and they were quiet. 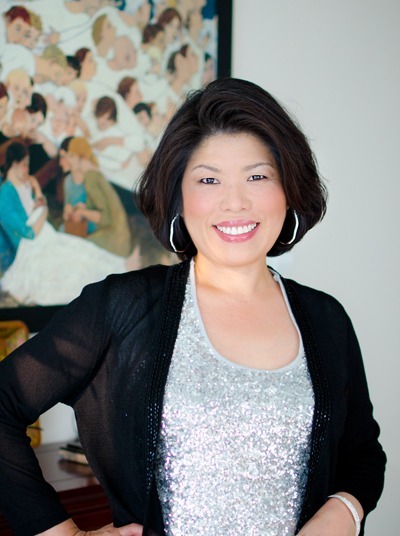 They were quiet because they were sincerely focused on eating." I love those moments also. 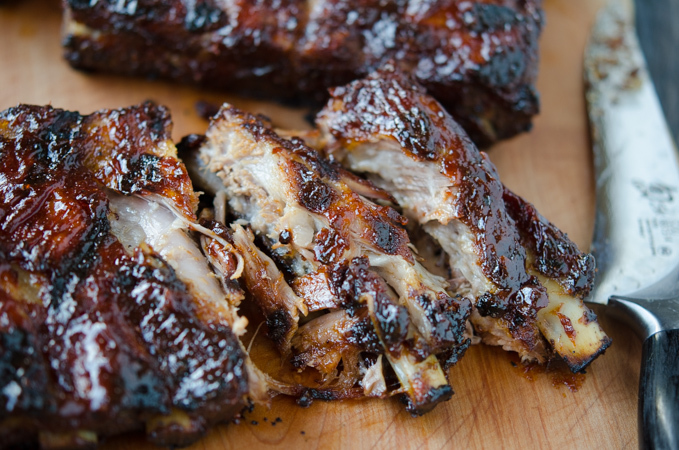 I cant resist ribs either... and your sticky, glossy, tender ribs look to die for! Yum!